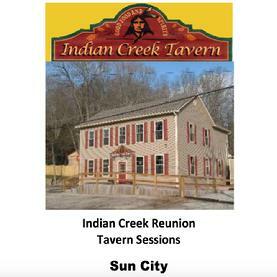 Indian Creek Reunion was decades in the making. Band members Mike Clements, Dave Kraus, Dale Hamilton and Tim Dumford finally got together and made a pact to get into the studio at Rockhill Records and create the music that had been waiting to be played for all these years. Master engineers at DFK Productions were called upon to put it all together. Sometimes the stars just align, and that's what happened at the studio. The life-experience lyrics, fine guitar licks, smooth bass and backbone percussion flowed together to create an amazing selection of songs, or rather, masterpieces that will be timeless. You will listen to them over and over again with a smile on your face. On January 1st, 2016, Indian Creek Reunion pre-released five singles that will be on their upcoming CD...You Don't Know, Cryin' Eyes, Lonesome Ole' Cowboy, San Juaquin and Sun City. Upload them and enjoy! Share them with your friends, they will thank you for that!